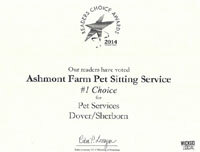 Ashmont Farm Pet Waggin requires an initial home visit before services are provided. During our peak times, (holidays, weekends, school vacations, summer) as much notices as possible is appreciated. We will do our best to meet emergency and last minute requests. 24 hours notice is required for changes in dates, early returns and cancellations. Less than that will result in full charges from that day’s visit. A holiday cancellation with less than 1 weeks notice prior to start date will be charged 50% of total assignment charges. A holiday cancellation with less than 24 hours notice will result in a 100% charge of total assignment charges. We will pick up your keys at no charge during initial consultation. We require 2 sets of keys, so we have one set in the office, in case of emergencies. Garage codes may be given as a secondary access, but a key must be on file. Keys will be held in our office on file. If you wish them returned after service, there is a $15.00 charge, or they may be mailed back to you for $5.00. We do not use keys hidden on property or shared with other individuals. Dogs will be walked in most weather conditions. If weather is severe, we may stay in yard, rather than on roadways, at sitter’s discretion. During winter months, your house must be accessible and safe for us and your pet. This means driveways plowed, paths shoveled, and ice melt down if needed. New clients: must pay in full before start of service. Existing clients: prompt payment is appreciated. There will be a $35.00 charge for returned checks. Owners will be left a note with information about how your pet did while you were away. Please call us immediately when you arrive home. If we do not hear from you, we will continue to see your pet until you return and phone us. This company does use independent contractors. When you travel, we do not share pet care responsibility with other individuals. Sorry, but we have learned this the hard way.